Caterpillar Creative Play is an app available in iOS and Android. The developer is StoryToys which have a range of book and story-related apps. 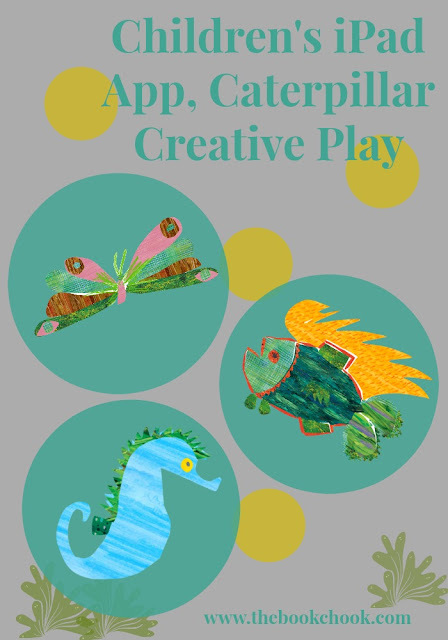 I really liked the way the app is faithful to The Hungry Caterpillar books’ illustrations. There are colourful digital prints to choose from, and kids can fill sections of a range of templates with each one if they want. They could also fill with plain colour via a digital paintbrush or pencil. There’s even more room for creativity if children ignore the templates and just choose a print and “cut out” any shapes by drawing with a finger. I had lots of fun doing this and it’s satisfying to play with the colours and patterns. There’s an educational side too. Kids will practise their hand-eye co-ordination by tracing the dotted lines of the templates. Older kids could use a stylus for even more accuracy of tracing. But most of all I loved how creative this app is. It would go perfectly with any Eric Carle read-aloud or be a great choice for Very Hungry Caterpillar Day. It’s one of those apps that will suit a range of ages, and grow with children. It can be used to a limited extent by any child old enough to draw and close a shape with a finger. This is so kids can fill that "closed" shape with a patterned print via the scissors icon. I read some reviews complaining that the tracing was too hard for some kids, but to me, this is where parents should be playing too, and make it free play rather than urging kids to “get it right”. Have fun together and enjoy playing with digital art!